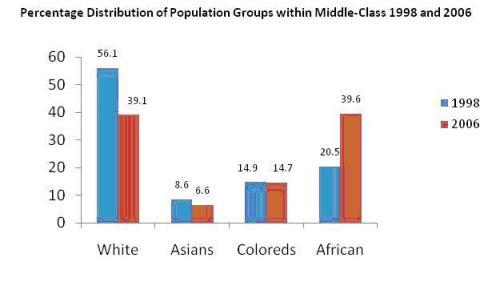 Continuing the thinking from my previous post on the various attempts to size and value the potential of the emerging African middle classes based primarily in dollar figures, I thought to take a step back from income data to see if I could approach the challenge of segmentation in a different way. 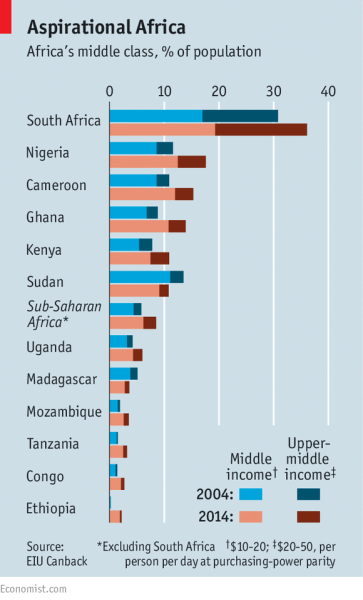 Below is the chart estimating the size of the original emerging African middle classes as posited by the African Development Bank back in 2011. That is, rather than simply segmenting by range of daily expenditure i.e. $2 to $4 or $10 to $20 a day, what if we took a closer look at the reasons behind the spending and segmented by consumer mindset and buyer behaviour. After all, given the size of the informal sector in the majority of African countries and the percentage of population relying on irregular income streams from a variety of sources, few can confidently expect to spend exactly $4 each day. There might be times of abundance when hundreds of dollars may be available, and big ticket items purchased like colour television sets, offset by times of scarcity when one might just be making ends meet. Variability in cash flow is an inherent characteristic of entrepreneurship, regardless of income bracket or revenue sources. Furthermore, we can add geography as a factor, since urban expenditure is of a highly different nature than that in rural regions. Taking all of this (and more, based on years of observations in the field among consumers) here is my version of consumer segmentation of the same demographic as covered in the chart above. The Middle class – traditional definition, white collar jobs, steady paycheck, education/professional qualifications, closely aligned with “upper middle class” in the AfDB chart. Floating class 1 (“Brass Ring Syndrome“) – seeking status signifiers that are the ‘brass ring’, that is, they are ready to leap upwards, are almost there, focused on investing in future revenue generation opportunities, aspirational, may tend to be seen more in rural areas than urban. Floating class 2 (“Fragile” or “Newborn”) – seeking footholds to gain enough stability to balance upon so as to make the leap for the brass ring, saving to invest in future revenue generation, hungry for more (not food but a mindset, as in hungrily seeking upward mobility), they may include the youth startups, tech entrepreneurs and all looking for the “something”, maybe more urban, and in the African contextual usage of the word “hustling” for the opportunity. “Bottom of the Pyramid” – The $2/day demographic made famous by CK Prahalad, they are the pool from which the above three segments are emerging and are critically important in Africa in a way that they aren’t in opposed to India for instance because they don’t think of themselves as permanently poor, just temporarily cash crunched, especially migrant workers. Very, very different consumption behaviour between urban and rural in this segment. They may indeed form the rural version of Floating Class 2. I include them here because AfDB segmentation starts at $2. Once one’s mindset has evolved into considering oneself as part of a certain lifestyle, even if one’s income is “floating”, there are changes in buying habits that remain as part of this upward mobility. An example is that of the milk ATMs in Kenya. That is why I believe that taking a closer look at shifts in household consumption patterns as indicators of emerging into the so called “middle class” may offer more valuable insights for consumer market analysis than attempting to segment by dollar figures alone.